Unbelievable, unbearable news, but just confirmed by Libération. Chantal Akerman Film Director "Crossing Cinematic Borders"
Using Chantal Akerman's News from Home  here the city of Berlin is the stage for another journey through another city. Reflective and reversing timelines encourage the visual to interact with the spoken testimony. The portrayal of desire on the cinema screen is necessarily problematic. Too often it is an assertion of masculine power, sometimes an idealised notion of romance, rarely the reality of sagging mattresses and aching muscles. Chantal Akerman's Je, tu, il, elle is set alongside two typical Hollywood portrayals of sexual passion. Chantal Akerman: Too Far, Too Close (Eng) from ARTtube on Vimeo. 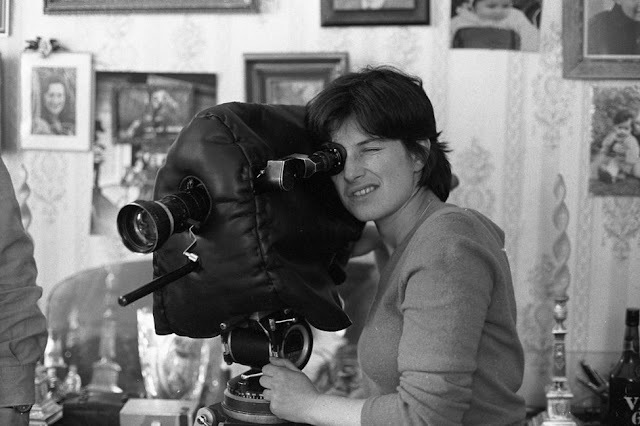 Belgian director Chantal Akerman gained world success with her masterpiece Jeanne Dielman, 23 Quai Du Commerce, 1080 Bruxelles (1975) and consolidated her reputation with films like Toute une Nuit, Les années 80 and Le Marteau. In the early nineties Akerman shifted her career from strictly film into the arts. She participated, amongst other exhibitions, at dOCUMENTA 10 and 11. It dated from 1995 since Akerman exhibited in her native country with a massive retrospective. In Too Far, Too Close the M HKA presented an overview from Akermans oeuvre starting with the 1968 production Saute ma Ville and ending with her most recent work, Maniac Summer.